Go See This contributor Evie Appleson reviews Represent! Voices 100 Years On, the new exhibit at the People’s History Museum. I recently attended the Represent! Voices 100 Years On exhibition at the People’s History Museum. The exhibition reflects on the past hundred years since the Representation of the People Act, passed in 1918, granted most men and some women in Britain the vote. My boyfriend came with me and said the exhibition was ‘maybe the best one he’s ever seen,’ which I think is an understatement. It was excellent. It was both educational and empowering in its ability to put an historical event in to a modern context. The lay out was effective in making the exhibition accessible. The bright colours, video displays and graffiti art across the walls gave the room a vibrant modern feel. Old artefacts were paired with modern displays of the same theme which highlighted how the fight for representation, especially for women, is an on-going process. A statue of Emmeline Pankhurst, the leader of the suffragette movement who devoted her life to achieving the vote for women, was placed next to a mannequin wearing a protest outfit worn by Sisters Uncut, a group who campaign against FGM. This highlighted how women are continuing to fight for their rights and how this fight is far from over. 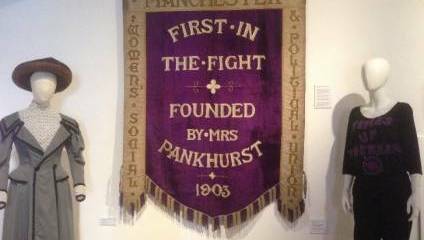 As well as the layout, there were also helpful definitions provided for words such as feminism or suffrage, which also made the exhibition highly accessible. Furthermore, viewers were encouraged to answer poll questions such as ‘Do you think the voting age should be lowered to 16?’. This encouraged visitors to engage with the exhibition and reflect on their own political opinions. It was excellent. It was both educational and empowering in its ability to put an historical event in to a modern context. I commend the exhibition for offering critical perspectives, specifically about the suffragette movement, as this is something I have never seen tackled before. Represent! focused on the work of all women, regardless of race or religion, in the fight for equal rights. The exhibition highlighted that the suffragette movement was dominated by white middle-class women and that women from other social and racial backgrounds were denied the vote in the Representation of the People Act. The exhibition reiterates that even now there’s still a lack of diversity in the UK’s political representation. The resounding message of the exhibition was that true equal rights means equal rights for EVERYONE, and therefore all types of people have to be represented in the fight to achieve them.